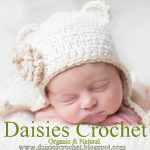 Daisies Crochet: Crochet headband and barefoot sandals. Pdf pattern barefoot sandals/lace headband set, hat flower, beach accessory, foot jewelry, girl lace. This barefoot sandals-lace and headband set are perfect for little Princess as an accessory to the beach, photo prop, flower girl or just for fun. Also is awesome birthday or Christmas gift. SIZE: From 2 y.o. to preteen. 5 pages, many photos. Photo tutorial. 1 skein for set of barefoot sandals and headband. >Aunt Lydia’s #3 Fashion Crochet Thread. 100% Mercerized cotton. Yardage/Meterage:150 yds/137 m.
or any other blend of similar yardage yarn. 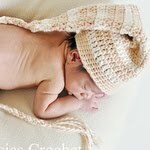 Very pretty, I wish I would have a little girl to crochet it for. Lovely! Little princess must be very happy!